Only four teams in the Big Ten were in action Sunday afternoon. In Columbus, Ohio, the Ohio State Buckeyes swept Michigan State in a match televised on ESPN2. The Buckeyes’ rival, #14 Michigan overcame a sluggish start to upend Maryland in four sets on the road. Michigan moves to 17-2, 6-2; Maryland falls to 12-8, 3-5 in the Big Ten. Outside hitter Carly Skojdt posted a double-double for the Wolverines, tallying 21 kills and 14 digs. Libero Jenna Lerg led Michigan’s defensive effort with 21 digs. Maryland was led by outside hitter Erika Pritchard‘s 18 kills. The Terrapins also got 14 kills from outside hitter Liz Twiley. Neither team was efficient on the attack, as the Wolverines hit just .200 while Maryland only mustered .129. Michigan is now 8-0 all-time against the Terrapins. #14 Michigan overcame a sluggish start Sunday afternoon to knock off Maryland in four sets. Maryland caught the Wolverines by surprise in the opening set, as it jumped in front 5-0 right away. The Terrapins kept Michigan at bay for most of the set, as they used a 4-0 spurt to go in front 17-11. Maryland then closed out the Wolverines 25-19 to take the first set. The second set was back and forth until Michigan used a 6-0 run to go in front 18-12. The Wolverines then conjured a 6-2 run to close out the set, 25-18. Michigan again gained an early advantage and led for most of the third set. But Maryland used a 5-0 run to cut the deficit to one at 22-21. The Wolverines scored three of the final four points for a 25-22 win. S4: Skjodt picks up her 18th kill of the day and puts Michigan up, 15-11! With a slim 13-11 advantage in the fourth set, the Wolverines then used an 8-2 run to take control at 21-13. The Terrapins won the next two points before Michigan took the final four points and the match, with a 25-15 win. Ohio State improves to 12-8, 3-5; Michigan State dips to 15-6, 3-5 in the Big Ten. The Buckeyes were led by outside hitter Bia Franklin, who tallied 14 kills and 12 digs. Middle blocker Madison Smeathers chipped in 13 kills and opposite hitter Vanja Bukilic added 10. Michigan State got 12 kills from outside hitter Alyssa Chronowski. The Spartans outhit the Buckeyes (.287-.282) despite falling in three sets. 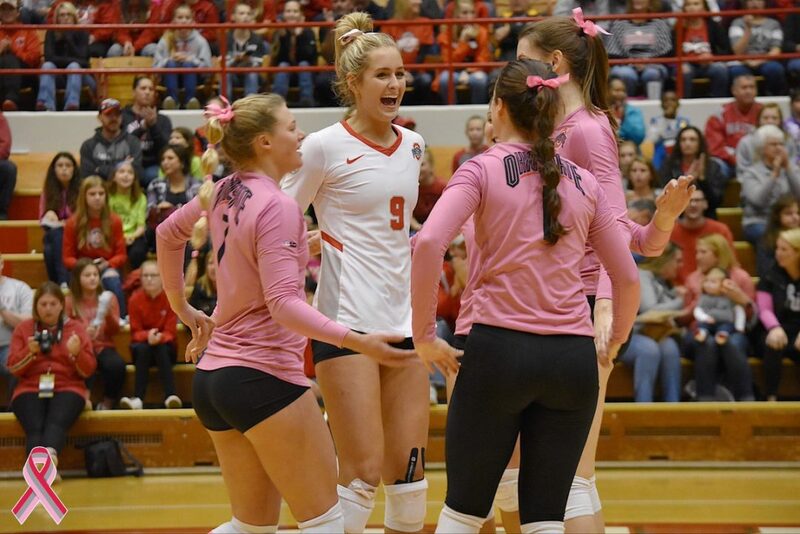 The Buckeyes snapped a two match losing streak with the win over Michigan State. 💗 Today we celebrated the Cancer Survivors. Ohio State will make the trip to Bloomington to take on Indiana at 7 p.m. ET Friday. Michigan State stays on the road for a matchup with Northwestern at 8 p.m. ET Friday. #14 Michigan remains on the road and takes on #7 Illinois at 8 p.m. ET Friday. Maryland heads west to take on #25 Purdue at 8 p.m. ET Friday.